Branch Meeting, 8 June, 2013. Born in Cloughmills, Belfast, the son of George & Agnes Rock, 22 year old Hugh was Killed in Action on 8 June 1917, on the second day of the Battle of Messines. 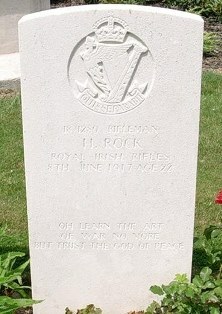 He was entitled to the British War & Victory Medals and is buried in Spanbroekmolen British Cemetery.